We're starting to get back into the swing of things around here. 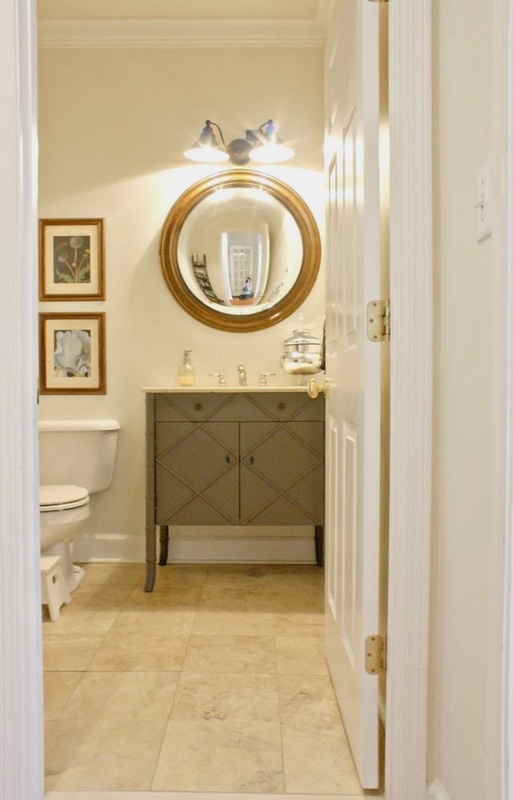 I've been dreaming up some plans to fix a few trouble spots in our kitchen, I'm making an Ikea run tonight, and I've finally got the powder room (mostly) put together. Progress feels good. So everything got a coat of paint: the walls, the ceiling (I've never been so excited by a plain white ceiling before! 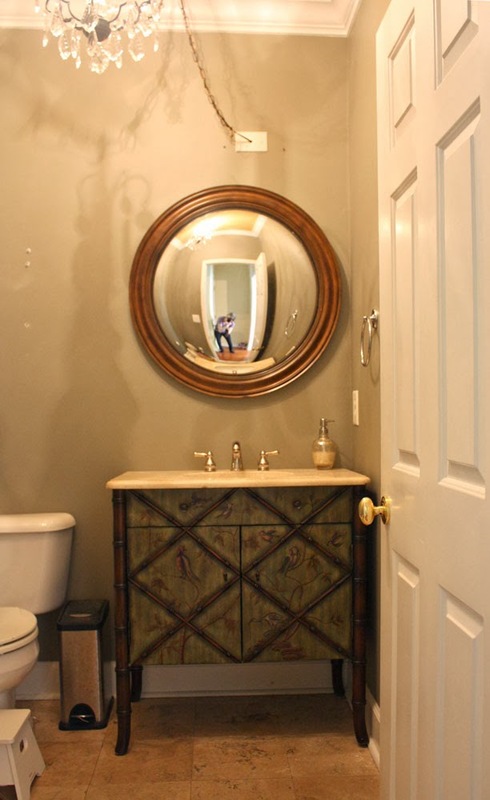 ), and the vanity. The vanity is Martha Stewart "Seal", and the walls are the same as everywhere else in our house: Sherwin Williams "Pearly White". We also replaced the light fixture with this one. I have a hard time finding bathroom lighting that I like that doesn't cost an arm and a leg. This one is cute, not bathroomy-looking, and $57. I picked up some pretty hand towels at Ross, and the rest of the accessories, the artwork, and the mirror I already had. Keith's not sold on the convex mirror in here, but I love it. It's just a little a bit quirky, which I think is a good thing. 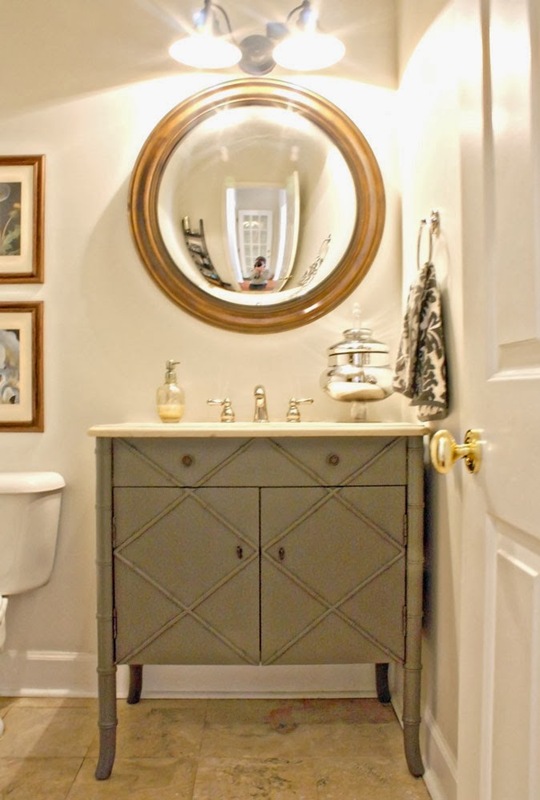 I spent about $150 in here total (including the vanity), so while it's not a dramatic overhaul, it is a pretty big change for the money spent. Yup, progress feels good!